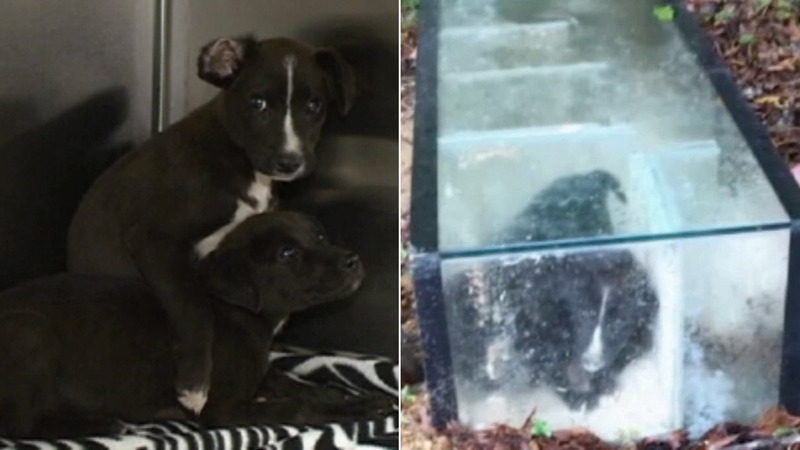 MISSISSIPPI -- A Mississippi man found two puppies trapped inside of a sealed glass aquarium near his home. Matt Williamson was out looking for his dogs near a creek in Hinds County when he made the shocking discovery. "As I got closer to it, I could see these eyes peering back at me, and they looked pretty desolate like they needed help. That's when I called it in to the authorities," he said. On the creek bank were the two pups locked inside with the lid cemented shut. Williamson said whomever placed the puppies in the aquarium wanted to drown them. The pups were taken to Mississippi Animal Rescue League where they will recover and find a new, loving home. Debra Boswell, director of Animal Rescue League, said the puppies may have been born in the wooded area because they are not used to human handling. Animal rescue staff will continue to keep the puppies isolated for a couple of days to keep their stress levels low. After another health check, the duo should be up for adoption.